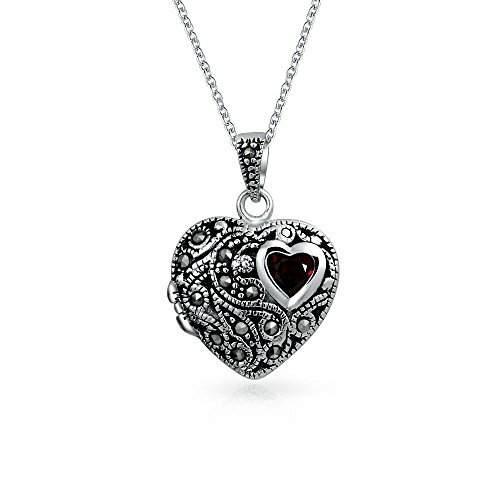 ICECARATS DESIGNER JEWELRY 925 STERLING SILVER MARCASITE HEART LOCKET CHAIN NECKLACEMaterial Purity : 925Finish : AntiquedLength : 7 mmChain Length : 18 inChain Width : 1 mmCharm/Element Length : 1 mmCharm/Element Width : 19 mmClasp /Connector : SpringlockManufacturing Process : CastedMaterial : Sterling SilverWidth : 19 mmEngravable : Not RecommendedProduct Type : JewelryJewelry Type : NecklacesSold By Unit : EachNecklace Type : Themed NecklaceBail Width : 4 mmMaterial Color : WhiteBail Length : 6 mmStone Type (Other) 1 : MarcasiteOUR MISSION & BELIEFSOur mission at IceCarats is to celebrate our customers and enhance their lives journey, honoring life's memorable occasions and enhancing the beauty of everyday through our extensive collection of quality jewelry.THE ICECARATS STORY - CRAFTSMANSHIP...QUALITY...VALUEJewelry is our passion - IceCarats is devoted to craftsmanship, quality, and value. Each piece hand stamped for authenticityMADE WITH LOVE FROM US TO YOU - QUALITY WITHOUT COMPROMISEWhen you purchase jewelry from the IceCarats collection, you buy with confidence - Lifetime Warranty and 30-Day Returns .ELEGANT GIFT PACKAGING - JUST ANOTHER REASON TO SAY YES!Receive Elegant Gift Packing On Every Order with IceCarats! 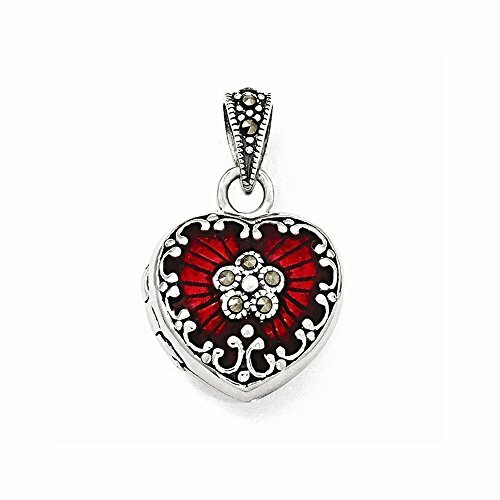 ICECARATS DESIGNER JEWELRY 925 STERLING SILVER RED ENAMEL MARCASITE HEART PHOTO PENDANT CHARM LOCKET CHAIN NECKLACE THAT HOLDS PICTURESMaterial Purity : 925Length : 26 mmMaterial : Accents : EnamelMaterial : Accent Color 1 : RedFeature : HollowManufacturing Process : CastedMaterial : Sterling SilverWidth : 16 mmProduct Type : JewelryJewelry Type : Pendants & CharmsSold By Unit : EachPendant/Charm Type : LocketBail Width : 3 mmMaterial Color : WhiteBail Length : 8 mmStone Type (Other) 1 : MarcasiteOUR MISSION & BELIEFSOur mission at IceCarats is to celebrate our customers and enhance their lives journey, honoring life's memorable occasions and enhancing the beauty of everyday through our extensive collection of quality jewelry.THE ICECARATS STORY - CRAFTSMANSHIP...QUALITY...VALUEJewelry is our passion - IceCarats is devoted to craftsmanship, quality, and value. Each piece hand stamped for authenticityMADE WITH LOVE FROM US TO YOU - QUALITY WITHOUT COMPROMISEWhen you purchase jewelry from the IceCarats collection, you buy with confidence - Lifetime Warranty and 30-Day Returns .ELEGANT GIFT PACKAGING - JUST ANOTHER REASON TO SAY YES!Receive Elegant Gift Packing On Every Order with IceCarats! 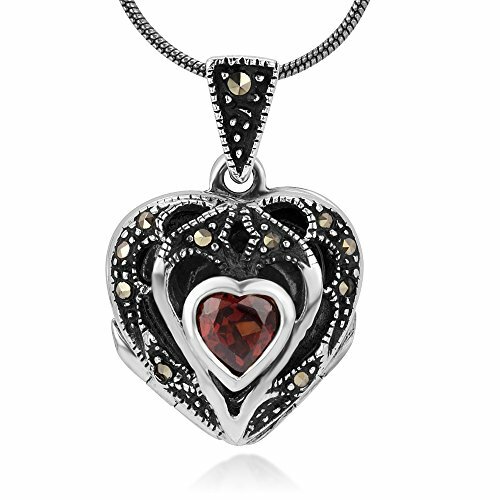 Keep your heart on your sleeve with our garnet and marcasite .925 Sterling Silver heart locket pendant. 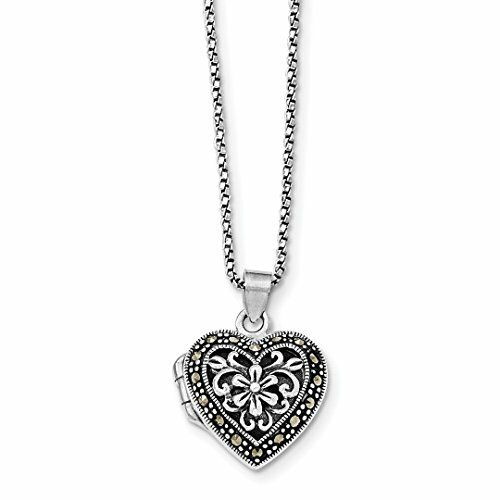 The face of the heart locket is engraved in a swirl pattern and studded with marcasite. A red garnet adorns it. January birthstone jewelry is a perfect gift for all of your January born friends. This .925 Sterling Silver locket is a great addition to any classic jewelry wardrobe. 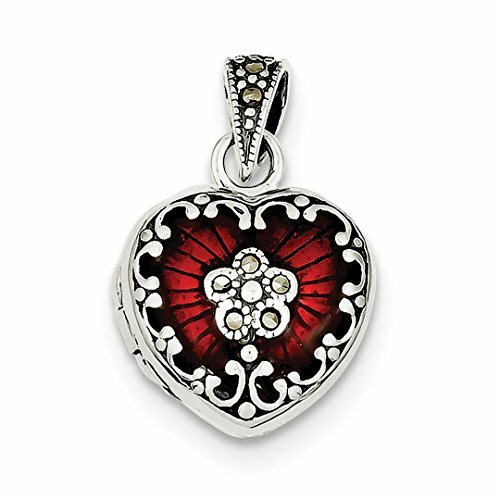 This Sterling Silver Red Enamel & Marcasite Heart Locket is made with expert craftsmanship and can be worn everyday for a lifetime. We guarantee that our silver jewelry is made with authentic solid sterling silver. Treat yourself to the luxury of brilliant sterling silver that will never go out of style. Features:Stone Type_1:AmethystStone Color_1:PurpleLength of Item:24 mmStone Treatment_1:HeatingWidth of Item:12 mmJewelry Type:Pendants & CharmsMaterial: Color:WhiteStone Creation Method_1:NaturalAll weights and measurements are approximate and may vary slightly from the listed information. 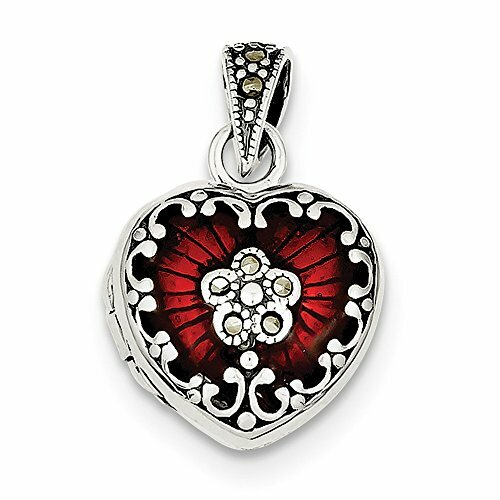 Looking for more Marcasite Heart Locket Pendant similar ideas? Try to explore these searches: Retro Stoneware, 89 Passenger Side Bracket, and Bride Groom Favor.